A beautifully framed liquid chalk marker board turns everyday notes and messages into an ever evolving work of art. It's a great way to add function to your home without sacrificing style. This high quality, 100 real wood decorative liquid chalk marker board features a modern 2 3/ 4-inch wide frame with a slightly rounded surface and beading on the inner lip that also makes it appropriate for use in a traditional setting. The finish is a medium silver with black highlights and burnished detailing on the beading. 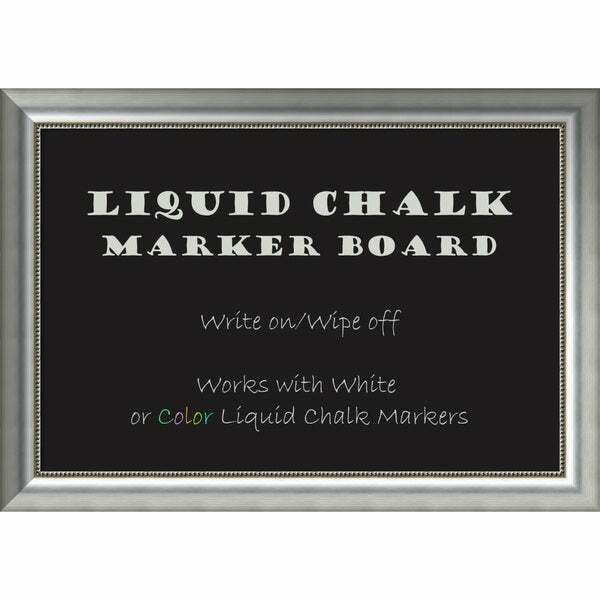 It works only with Liquid Chalk Markers (not included) and wipes clean with a damp cloth. Will not work with traditional dry chalk. This board is handmade in a small custom art and frame shop in the American heartland - you can be proud to display it in your home.